LEMON DROP | Pro Chem, Inc. 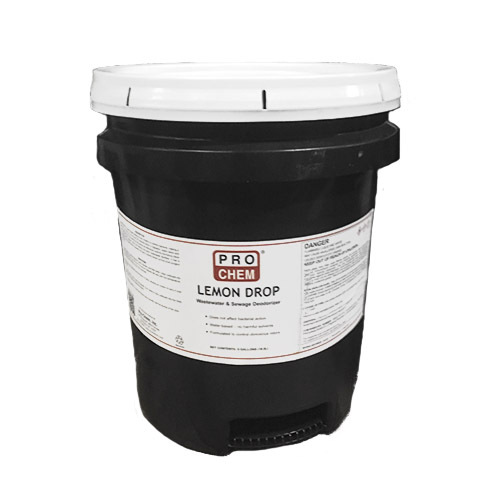 LEMON DROP is a water-based deodorizer that contains no harmful solvents, making it perfect for use when you do not want the bacterial action in digesters, septic tanks and drain fields disturbed. Its powerful formula quickly and effectively controls obnoxious odors in sewage plants, lagoons, mains and laterals and other wastewater facilities. It has a pleasant, lemon fragrance that is powerful enough to quickly knock out the most pungent of odors. For garbage containers, trucks and dumps, spray liberally over the source of the odor.